But it’s not all doom and gloom on the Skeleton Coast. Far from it, in fact. For one, there is Hoanib Skeleton Coast Camp, a comfortable oasis in a veritable sea of wildness. 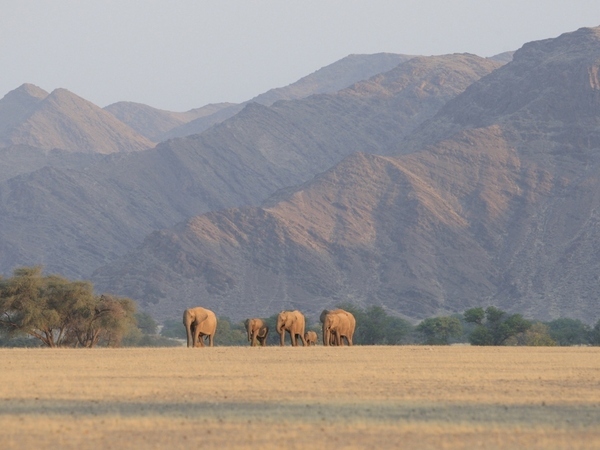 It sits in the northern Palmwag Concession at the confluences of two tributaries of the Hoanib River on the edge of Skeleton Coast National Park. It is the perfect spot from which to explore and enjoy the marvels of this exceptional and seldom-visited corner of the globe. 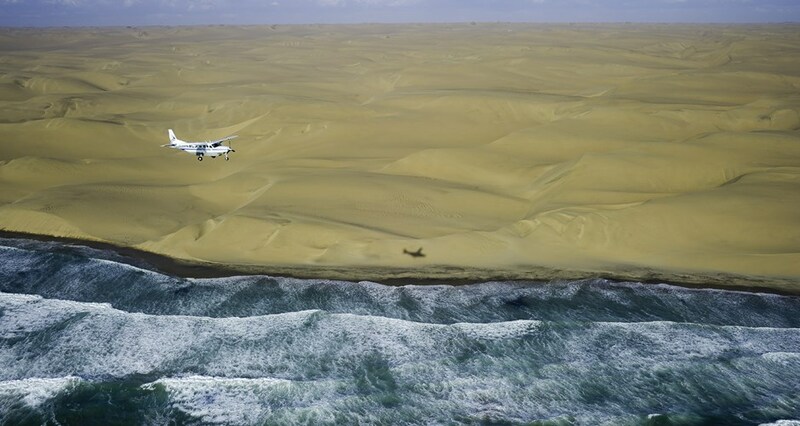 Due to its extreme remoteness, the camp is only accessible by light aircraft, which means visitors are treated to a stunning, bird’s-eye view of the Skeleton Coast on the way in and out. 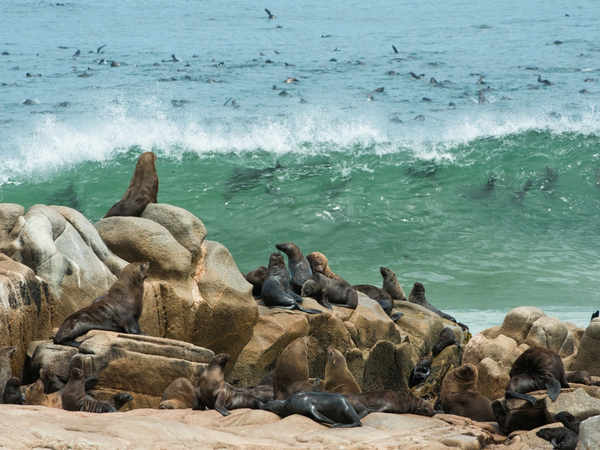 It’s easy to become quickly mesmerized by the miles and miles of stark coastline, with its incessantly pounding surf, punctuated by massive seal colonies and an occasional rusting shipwreck erupting through the sand. This isn’t the Serengeti or the Okavango Delta, so don’t expect to be surrounded by wildlife all of the time. But many species do manage, seemingly against all odds, to eke out an existence here, including desert-adapted elephant, giraffe, springbok, oryx, steenbok, jackal and ostrich. Lion and the rare and fascinating brown hyena are also spotted on occasion. There is something special about seeing wildlife against such a strange, hauntingly beautiful backdrop. In the desert, it’s usually the little things that are the most interesting. 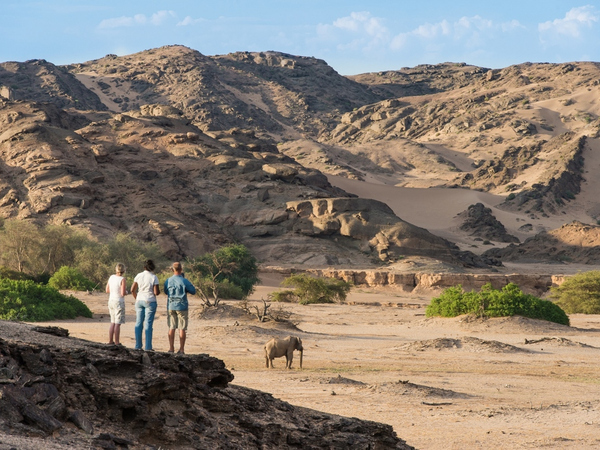 And the best way to see the little things is on foot, which is why Hoanib Skeleton Coast Camp offers fantastic interpretive nature walks. Learn about the amazing adaptations that allow a surprising variety of plants, reptiles, bugs and birds to survive here. You may also come across rock art and shards of pottery, vestiges of the aboriginal people that once lived here. In addition to traditional game drives, the camp’s staff can arrange a full day-excursion to the coast (if you’re staying at least three nights) by 4×4 to check out shipwrecks and Cape fur seal colonies. You can also take a full day trip to Klein Oasis and Auses Springs, where elephants and other wildlife come to drink. It may be the closest you ever get to the feeling of exploring the surface of Mars. 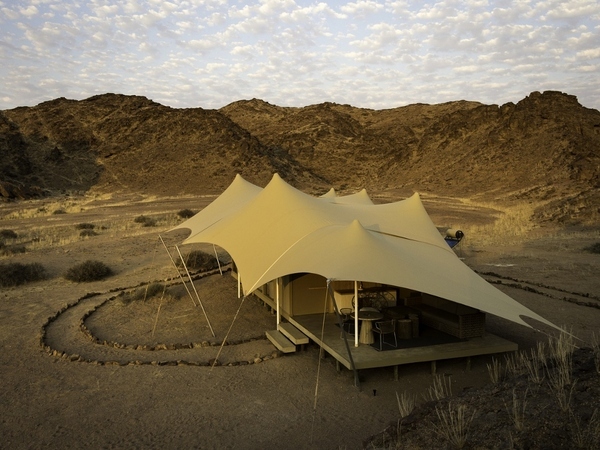 The first time you lay yours on Hoanib Skeleton Coast Camp, you may have to ask yourself if it’s a safari camp or a set piece for the new Star Wars movie. The draped canvas tents mimic the shape and color of the surrounding dunes, blurring the distinction between indoors and out. Each tent has a private veranda with an outdoor living area that provides stunning views of the surrounding landscapes, further diminishing the line between the camp and its dramatic setting.